His Holiness Dalai Lama is the spiritual and political leader of Tibet. 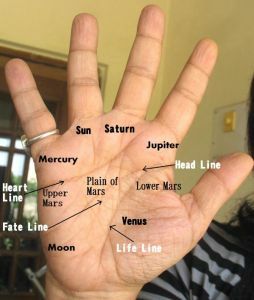 As a palmist and hand reader, one would expect significant differences between his passive and active hands because his life changed dramatically when he was a child and this would have impacted his personality and the future. The passive hand shows inherited qualities (in Dalai Lama's case his left hand is the passive . one) and the right active hand would show the current state of his mind. The Dalai Lama was born in a poor family and his name was Lhamo Thondup. If he had not been “recognized” as the Dalai Lama he would have led an ordinary life. imagination. Expectedly, these qualities were enhanced, due to his upbringing. His Headline is stronger and more balanced on his right hand and the shape of his Upper Mount of Moon has changed, telling us that a higher type of imagination was developed. However, his Headline reveals that as he grows older he will tend to live in his own world, although his engagement with people will never stop. On his left hand the Life Line restricts the Mount of Venus, but on the right hand the Life Line ends between Venus and Moon. This shows that the Dalai Lama became someone who would reach out (with his love and compassion) to all. His love would not be limited. The shape of the Mount of Venus is also not the same, with the lower part less developed in the right hand. This shows that sexual passions were suppressed/controlled. He has a long deep Heart Line which tells you of a person dominated by his emotions and his heart, and also someone idealistic and sentimental. This is an inborn trait but a sister line has appeared on his right hand at the start of the Heart Line, strengthening it. This means that his Heart qualities have increased. His Head Line (on both hands) shows a non-materialistic person. The Head Line seems to start on Jupiter on the right hand (although this cannot be confirmed due to the poor quality of photos) and if it does, then it shows unusual leadership ability which has developed over the years. It shows a person who is confident and mentally strong (confirmed by the Upper Mount of Mars) and someone with an uncanny ability to rule and control without seeming to do so. The only negative change that is visible (when one compares the two hands) is that the Dalai Lama's ascetic qualities have decreased. This seems puzzling. Despite many photographs of the Dalai Lama's hands available on the internet, the lines are not as clear as I would like them to be. And as his fingers are bent inwards, it is not possible to measure the relative length of his fingers. This limits the reading of his hands. Or try the label Spiritual leaders for hand readings of Spiritual Leaders from different parts of the world including the Pope, the Ayatollah, Mother Theresa and also Mahatma Gandhi, Sai Baba or Dr. Sarvepalli Radhakrishnan. "someone with an uncanny ability to rule and control without seeming to do so" - I guess that summarizes the character... I do agree that he is a very different leader, but I guess it is to do with the trait of the people whom he leads. But I always admire his guts. Me too. He is one person I respect because I feel goodness is oozing out of him! His hand proves it. He has a very soft heart. Vishesh, Dalai Lama does seem to have a quality which draws others to him even though they are not Buddhists. This is very unusual for a religious leader. Shiva, several people have asked me to do his analysis but unfortunately I do not have any decent pictures of his hands. Fascinatng. I wonder what you would find in the hand reading of Gyaltsen Norbu, the Llama the Chinese are trying to force on Tibet? I dont imagine there are enough photos out there for a reading, but if there ever were, it would be curious to know if the man really does have a spiritual gift or calling, or is simply being railroaded into this role. Gyaltsen Norbu's hand would make interesting reading and will look out for the photos. Thanks. I think the fate line is interesting. At just the age when he was forced to flee Tibet (26) his fate line strays from it's straight course. Do you use timelines on any of the lines? If so, have you found them to be accurate? Erin, yes, I do measure time. I find that timelines are quite accurate on the fateline and lifeline, specially before the age of 50. After that it can become tricky. Measuring time on the Head and Heartlines is more accurate till the age of 30 but I am attempting to develop a more accurate system.